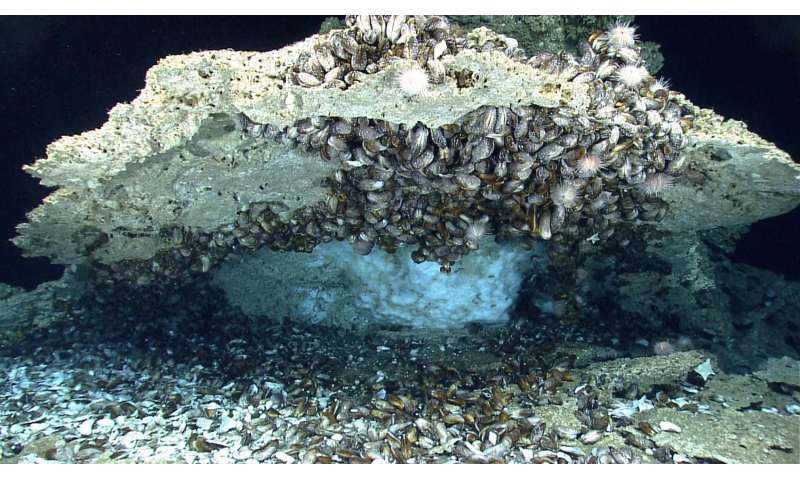 Gas hydrate (white, ice-like material) under authigenic carbonate rock that is encrusted with deep-sea chemosynthetic mussels and other organisms on the seafloor of the northern Gulf of Mexico at 966 m (~3170 ft) water depth. Although gas hydrate that forms on the seafloor is not an important component of the global gas hydrate inventory, deposits such as these demonstrate that methane and other gases cross the seafloor and enter the ocean. Credit: Photograph was taken by the Deep Discoverer remotely operated vehicle in April 2014 and is courtesy of the National Oceanic and Atmospheric Administration's Ocean Exploration and Research Program. "Our review is the culmination of nearly a decade of original research by the USGS, my coauthor Professor John Kessler at the University of Rochester, and many other groups in the community," said USGS geophysicist Carolyn Ruppel, who is the paper's lead author and oversees the USGS Gas Hydrates Project. "After so many years spent determining where gas hydrates are breaking down and measuring methane flux at the sea-air interface, we suggest that conclusive evidence for release of hydrate-related methane to the atmosphere is lacking." Professor Kessler explains that, "Even where we do see slightly elevated emissions of methane at the sea-air interface, our research shows that this methane is rarely attributable to gas hydrate degradation." 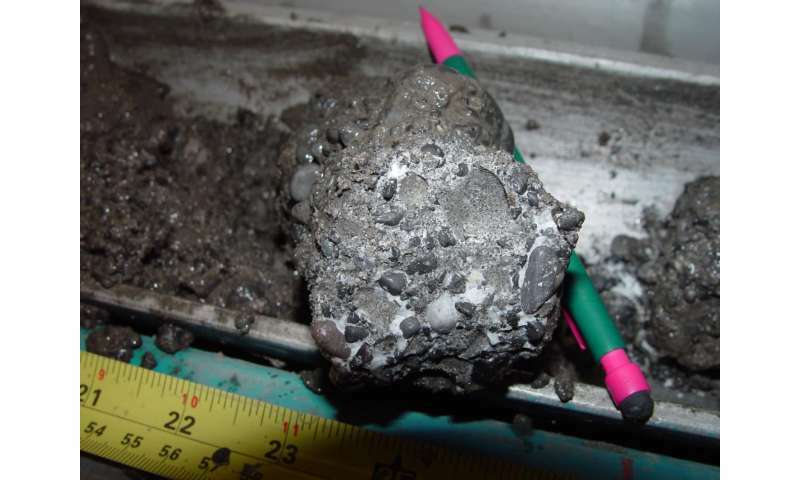 A sample of gas hydrate from the Mallik Test Well in Canada. Credit: Credit: USGS. 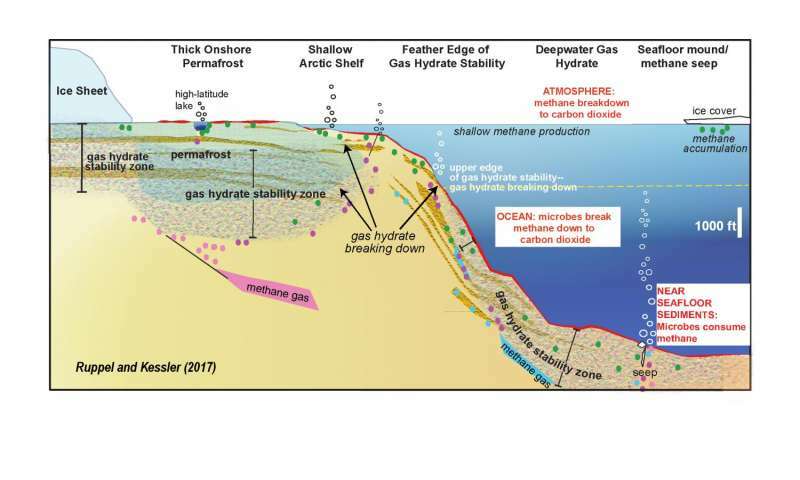 Virginia Burkett, USGS Associate Director for Climate and Land Use Change, noted, "This review paper provides a truly comprehensive synthesis of the knowledge on the interaction of gas hydrates and climate during the contemporary period. 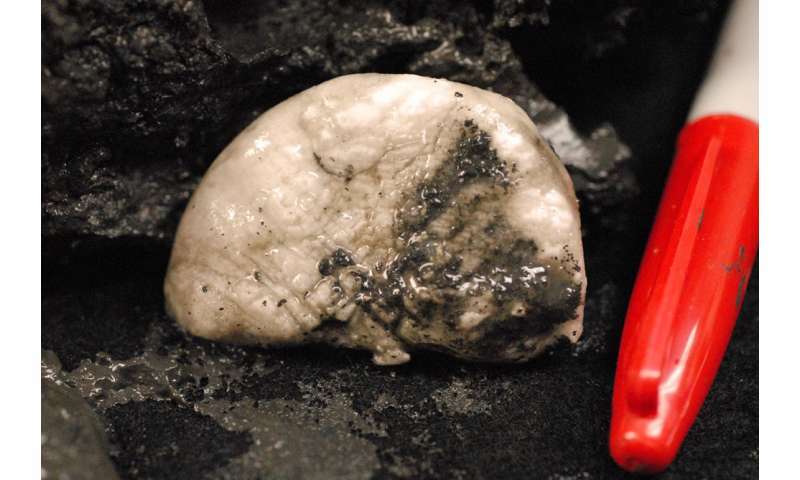 The authors' sober, data-driven analyses and conclusions challenge the popular perception that warming climate will lead to a catastrophic release of methane to the atmosphere as a result of gas hydrate breakdown." Phew, well that is one panic averted. Plenty more still on the table. I would love to accept this explanation but there are several details that have not been looked at which would suggest that a massive release can and most likely will happen. Methane plumes have been popping up everywhere where there weren't any before. Please tell us that warmer waters are not causing these plumes to occur. I noticed that you will not allow me to post the evidence of the plumes. Look it up yourself. It will be from Scientific America "150,000 methane plumes as the Arctic Ice retreats". Uh huh, stop sniffing the plume from your pants, it's effect is quite obvious. "Estimates vary, but conservative figures place global reserves at roughly 3 trillion tons of previously untapped carbon -- more than is trapped in all the other known fossil fuel reserves put together, says Klaus Wallmann of the Leibniz Institute of Marine Science in Kiel, Germany"
-We keep finding more and more hydrocarbons on this planet that we never imagined existed, as well as throughout the solar system, and people keep insisting that the stuff on earth alone comes from dead plants and animals. Its the same with water. You would have to assume first that this material was present like everything else in the protoplanetary disk, and congealed out at the same time. When some greedy company starts mining these, we can probably expect a big disaster if an uncontrolled breakout occurs. We are more clever than intelligent. I'd be more afraid of a gov't agency running the show, look how well they managed california's dams.